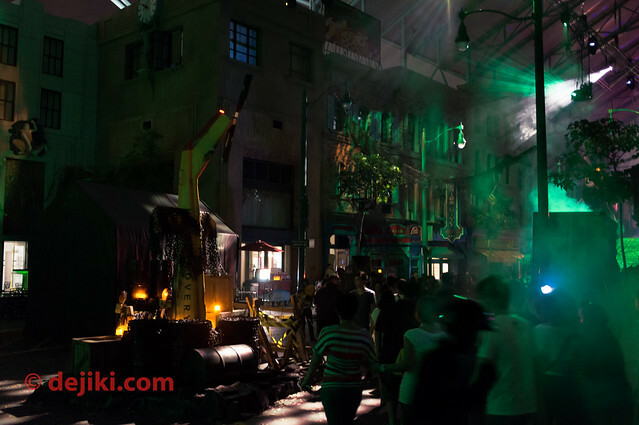 When night falls this October, Universal Studios Singapore will succumb to the harrowing forces of horror once again. Enveloped by the sinister powers of the Puppetmaster and his legion of evil, the park has transformed into several domains of fear where terror dominates and nightmares never end. 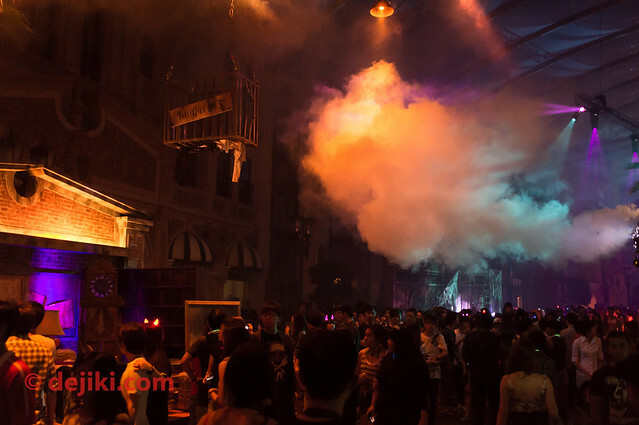 Resorts World at Sentosa and Universal Studios Singapore has turned up the standards for Halloween Horror Nights 2, outperforming what they have achieved last year with more impressive efforts in theming, concept and scares. There are a LOT more scare actors this year and the entire park was open for guests to roam… or run. I had a fantastic experience attending Halloween Horror Nights 2 at USS with my sister and two fearless friends. Here is my review and trip report for one of the must-go events in Singapore. The entire park is open this year, with 10 attractions running and 3 new Haunted Houses to experience. The Dreamworks zone (Far Far Away and Madagascar) do not have any scare actors, theming or special effects. They provide a more direct path to The Insanitarium Haunted house. Scare zones this year are extremely elaborate and a great deal of effort went into the detail and execution. I felt that all of them surpassed the original scare zones in 2011, except for Total Lockdown. 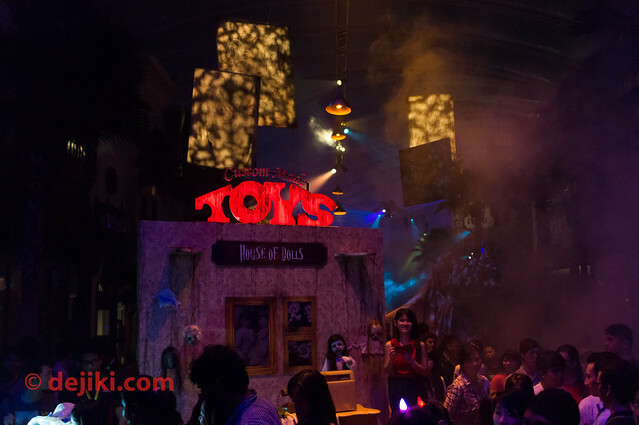 RWS advertised that there will be a “a frightful maze of five highly immersive scare zones” and three haunted houses, but there were only three scare zones: House of Dolls, Total Lockdown and Bizarre Bazaar. On the Event Guide, they are grouped together with Haunted Houses as 6 “Haunted Attractions”. This is quite mystifying, because there is no theming or scare actors at Sci-Fi City and The Lost World. There is no explanation for the two missing scare zones. The three haunted houses this year were incredible and the scare level definitely went up by a few notches. Death Alley is still short, with its very limited space to work with, but is quite a satisfying experience. I hope the park increases the number of haunted houses next year. As for the other two mazes, scroll down for a brief write-up on the walkthrough experience. The mazes this year use a lot of effects, including a fair bit of water as well, so be prepared. It’s the park’s second Halloween Horror Nights and it has not used characters, themes and elements from existing films and video-games. Instead, Universal Studios Singapore has developed its own characters and themes. The concept this year feels a little scattered compared to 2011. Having the Director and “The Final Cut” are very safe ideas, but placing guests as victims of multiple “horror films” (scare zones and haunted houses) works naturally with the concept of a Universal Studios theme park. I understand that the Puppetmaster is this year’s icon (and supposedly “controlling” the other three characters), but it is hard to see any connection beyond his House of Dolls. After walking out of the first zone, the other houses and mazes appear to be exist independently. He does have a very short (and VERY easily missed) appearance in another scare zone. That is just nit-picking on my part, but the HHN events in the US were more well developed with a broad theme for each year. One complaint this year is that the park sells a lot of flashy accessories (from lighted wands to swords) that guests could bring into the haunted houses. The lights from these toys were so bright that it ruins the effect of the Haunted Houses. Some of the park crew stationed inside would ask the guests to switch them off, but I observed that it was not strictly enforced. Crowd control could also been better. 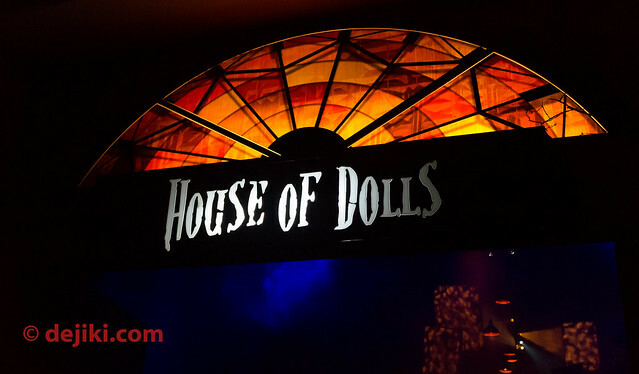 The House of Dolls was very difficult to walk through because of the amount of props and sets there. There was also some crowd flow issues with the Dungeon of Damnation, causing the walkthrough to slow to a halt at the very first room. The short event hours (4 hours) caused many guests to be very conscious (and upset) of the long waiting time. I feel that the park should start Halloween Horror Nights from 6:30pm or 7:00pm, just like the parks in America. Halloween Horror Nights 2 event hours will be extended. 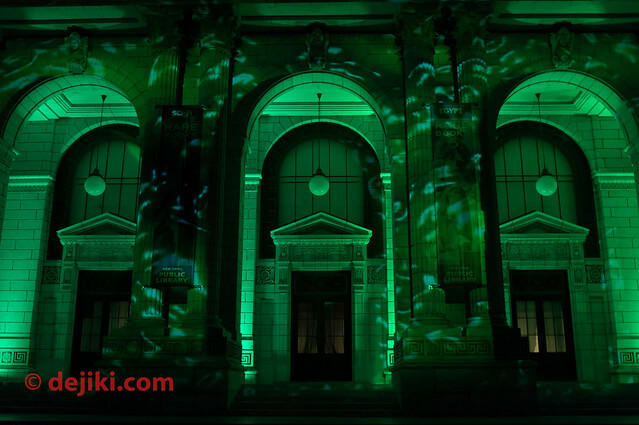 The event now runs from 8:00PM~1:00AM on 25/10/2012 to 28/10/2012. Opening Night was not a sold-out night, but the park was already very packed. Wait times for attractions go up to 90-120 minutes. It might be wise to get Halloween Horror Nights Express passes, but do note that they cost $40 this year. The reason the price doubled (from last year’s $20) is because they could be used in all 10 attractions and 3 haunted houses. Be aware that while event ends at 12AM, the queues for attractions only close at 12AM (sharp! ), hence you may still have some extra time to enjoy the park’s attractions and haunted houses. I have received feedback that HHN2 was very crowded and there was barely enough time to even visit all of Haunted Houses. I have also experienced it myself, waiting in line for more than 90 minutes for the Dungeon of Damnation. Many guests felt cheated that they could not experience all the attractions that were operating – although frankly, this is to be expected in any theme park. Some even said that they were only able to visit one Haunted House after queuing for more than 2 hours. I felt that the crowd and waiting times were still manageable on 19/10/2012, but on 20/10/2012 things were totally different. It was announced to be sold-out and it was rumoured that more than 15,000 guests attended the second night. The heavy rain before 8PM meant that some areas of the park were wet and not ready for guests. Wait times for Haunted Houses were very long, up to 2.5 hours. The queues had to close at 12AM sharp as there was still a long queue of guests. This means that many people were unable to experience more than one Haunted House during the 4 hours of event time. Perhaps the park should not have sold so many tickets when the event hours are short, and the Haunted Houses are unable to accommodate the immensely large crowds. If you do not intend to get an Express pass, you must have some sort of plan (and alternate plans) when you visit the park during Halloween Horror Nights, or you will fall victim to the long queues and end up not being able to experience much. Dungeon of Damnation, Death Alley, The Insanitarium, Monster Rock, Transformers: The Ride, Battlestar Galactica: Cylon, Battlestar Galactica: Human, Accelerator, Revenge of the Mummy, Jurrasic Park Rapids Adventure, Enchanted Airways, Shrek 4D. This strategy prioritises Haunted Houses and Scare zone experience over the park’s usual attractions. Take note that this is one possible strategy you could adopt, but if every reader follows this, then there’ll be trouble. List down your party’s priorities – Is everyone mentally ready to experience the Haunted Houses first? Or do they prefer to try the usual attractions instead? 1. Be at park gates at 7:00pm. Wait for gates to be open and line up in front of the turnstiles. Line up neatly, at the RIGHT lanes (the signs either display “ENTRY” or “HALLOWEEN”). 2. Once the ticket scanning frenzy starts, get your tickets validated at the turnstile and move into the park quickly. – Bring along a foldable umbrella. You won’t know if it rains, and the queues for the Haunted Houses are not completely sheltered. – The park sells plastic ponchos at $3. – Wear comfortable flat footwear. You might need to stand in line for a long periods. Also, the Haunted Houses and scare zones may have uneven, slippery flooring. Some rooms in the Insanitarium Haunted House have floors that are constantly wet. Some rooms in The Dungeon of Damnation have unstable and uneven floor, with some elevation changes in the dark. Ladies, please DO NOT wear heels or platform shoes for your own safety. – Bring along sufficient cash, because F&B carts and Poncho vendors only accept cash. What if it rains during HHN2? – Some scare zones may be temporarily closed. – Scare actors may not roam at some areas. – Outdoor rides, such as Battlestar Galactica, Canopy Flyer and Enchanted Airways may not operate during heavy rain. The rides will stop operations temporarily if lightning is detected. – Death Alley (Haunted House) may be temporarily closed. – Guests may continue to queue for The Insanitarium and Dungeon of Damnation, but be aware that the queue for Dungeon of Damnation is not sheltered. 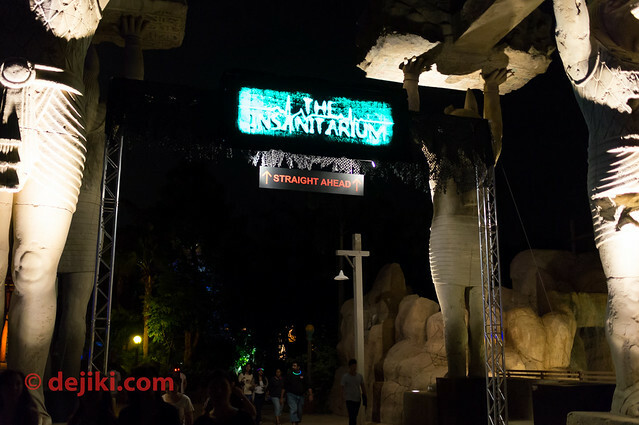 The queue for The Insanitarium is sheltered once guests reach the Waterworld theatre. 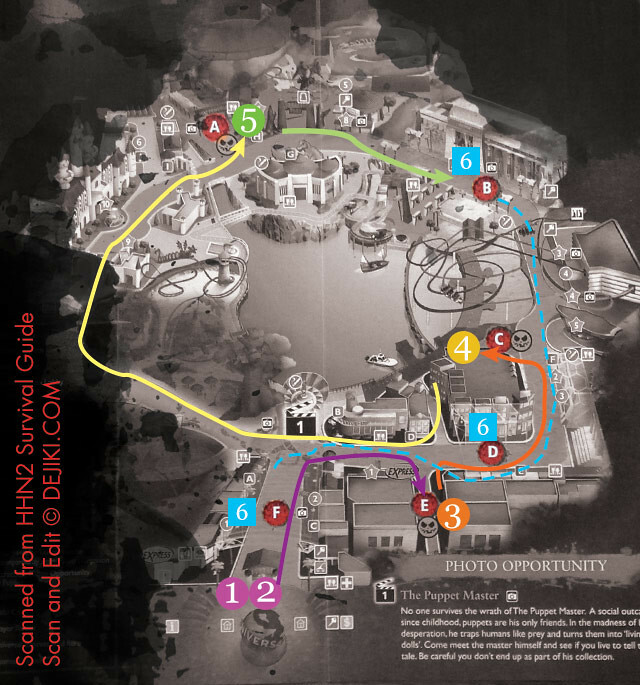 I will be rating each scare zone similar to how Steve Rowin did for his review of Universal Studios Hollywood’s Halloween Horror Nights in 2011. Essentially, three scores: The Story concept – how compelling and engaging the narrative is. 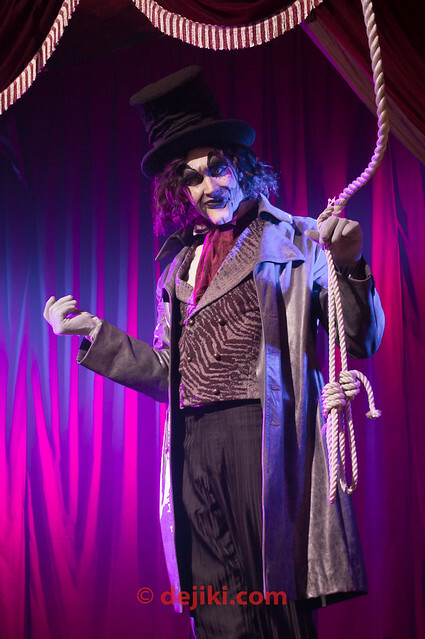 Presentation scores the production values for theming, including props, special effects and scare actors’ costuming and make-up. Scare Factor rates how scary each zone or house was, including scare actors’ performance. All Rights Reserved. All content on this site, including but not limited to images and text, is property of Dejiki Nicholas / dejiki.com (except where stated) and is protected by Digital Millennium Copyright Act (DMCA) and the Singapore Intellectual Property Law. 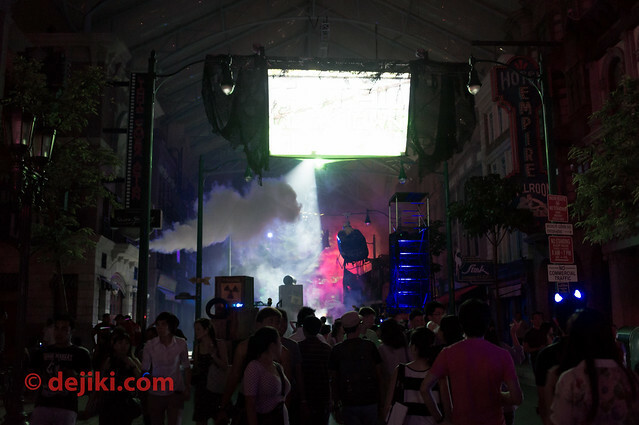 Only HHNinPhotographs.com is authorized to reproduce photographs from HHN 2012 coverage on dejiki.com. If you wish to use ANY content (photos and/or text) for any purpose, please contact us. 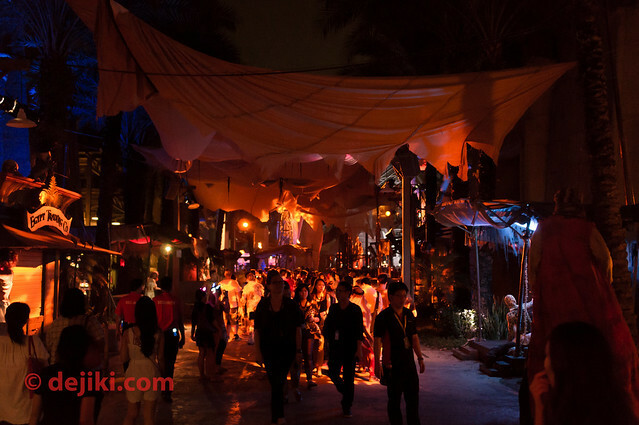 There are three scare zones this year, taking place at Hollywood, New York and Ancient Egypt. The Lost World area (leading towards Waterworld) acts as a mini scare zone with random encounters with scare actors dressed as mental patients. 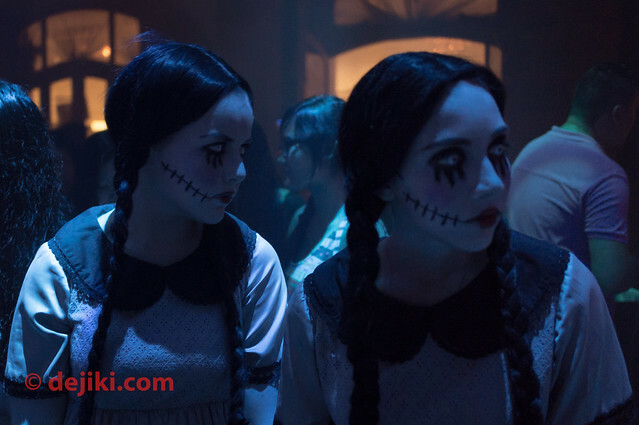 Some people have said that there aren’t as many scare actors as last year’s event. Here is a very rough list of characters that I could recall or see from my huge set of photographs. RWS claims that there are 350~400+ scare actors this year, but take note that most characters are played by multiple actors (usually two actors to each role), and they take turns to perform. Not all characters are available at the same time, so you will need to revisit a scare zone to find them all. – At least 10 unique “insane” inmates roam the entrance. Some travel in pairs. 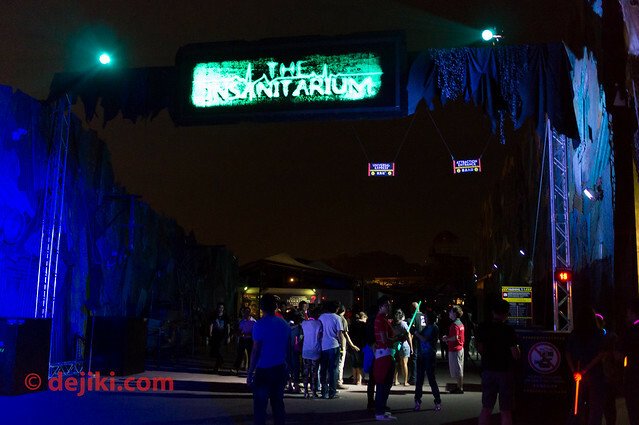 The opening scare zone promises to intrigue and horrify, and indeed it does. 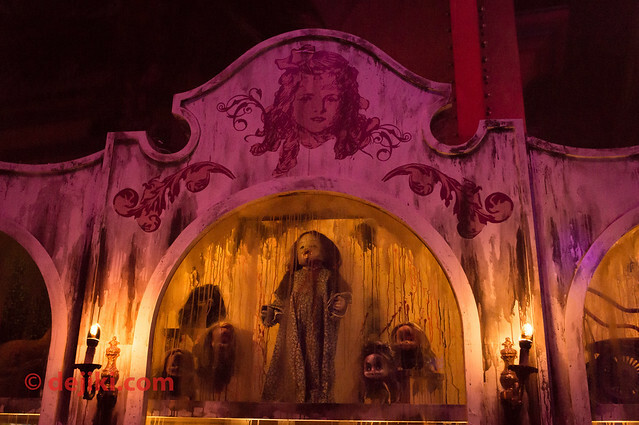 There are multiple sets here, each filled with freaky abominations crafted by the Puppetmaster – the icon of Halloween Horror Nights this year. Apart from that, there are so many roaming “friends” of the Puppetmaster, from the twisted porcelain dolls to the life-size, to “almost perfect” figures. 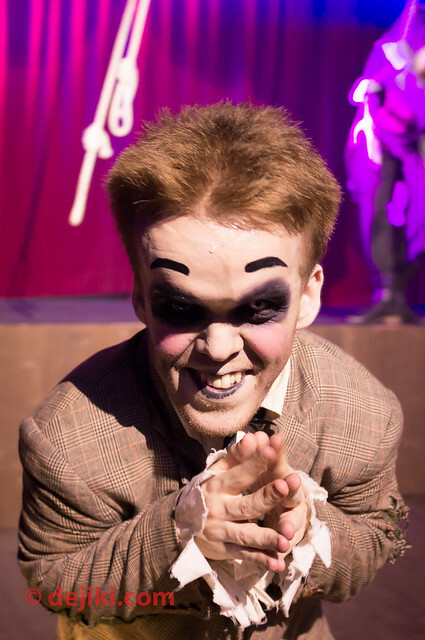 Park guests will witness the Puppetmaster’s fascination for perfection and uncover the truth behind his life-like dolls and the disappearing visitors that ventured into his workshop. There are also morbid toys displayed in the creepy cabinets, and strange objects that you probably won’t find a child playing with. The Puppetmaster keeps himself to his elaborate stage, the “Now Showing” platform at the end of Hollywood Boulevard. This is where he, and his aide, strings up and traps his latest victims (for souvenir photos). Overall, this zone is an impressive undertaking of the classic “killer toys” genre of horror – with a mash-up with the Puppetmaster’s obsession to craft “perfect human-like dolls”, that is reflective of a horror film called “Dead Silence”. There are several talented scare actors here that are pretty convincing “dolls” – watch out for the one on the “clockwork” set. 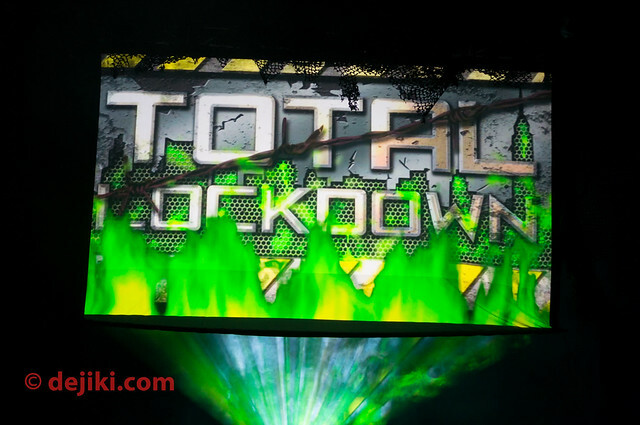 Total Lockdown looks like a nod to last year’s Post-Apocalyptic Rage. I would say that it could be a prequel because this zone portrays an ongoing disaster scenario, whereas Post Apocalyptic Rage could be what happens after – a zombie outbreak. A helicopter crashed into the city, while a truck was destroyed, spilling its radioactive contents. The title for this zone is a video screen. Look closely and you may see glimpse of the force behind this disaster. The streets of New York were bathed in chaos, filled with destroyed objects and signs of biohazard. Demented civilians, shell-shocked by the crash, prowl the streets. Here, they scream from the pain caused by the radiation poisoning, or mourn for their loved ones. The military and police patrol the street – enforcing the quarantine. I felt that this scare zone could’ve been a lot more. The props were more impressive, but the scare actors were not as scary as infected/zombies in Post-Apocalyptic Rage. 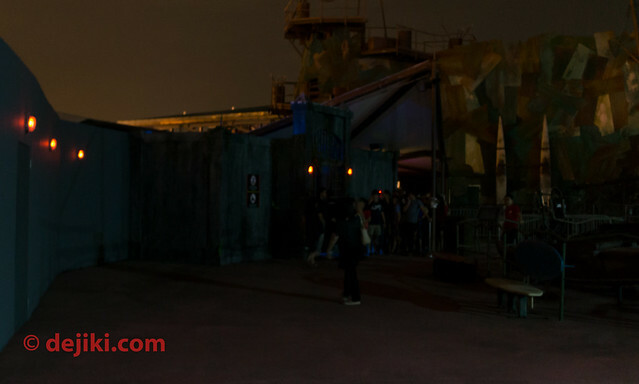 However, as the scare actors are not zombies in Total Lockdown, they could talk, run and react a lot faster to guests. In fact, most of them would just run away most of the time. At first glance, this zone does appear to lack scare actors. 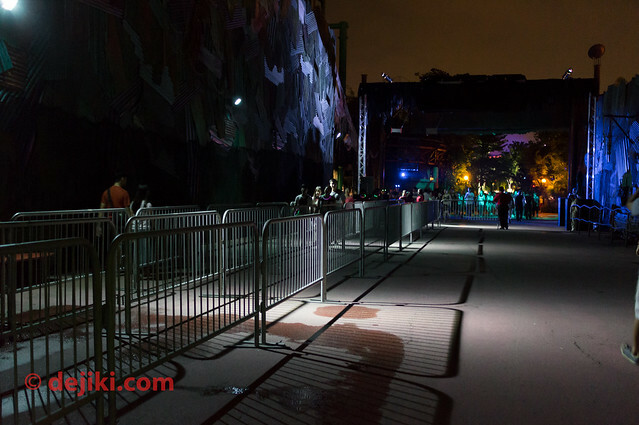 However, there could be the same number as roaming zombies last year, but as the scare actors here are split into “victims” and “quarantine enforcement” groups (that don’t quite interact with park guests), the streets may seem empty. In fact there isn’t much going on in front of the New York Library, unlike last year. Or well, the lack of engaging scare actors (and amount of interaction) in Total Lockdown could be part of the disaster/quarantine experience. Click here for more photos and a walkthrough video of Total Lockdown. This scare zone has improved a lot from last year’s “The Edge of Darkness”, which seemed more like the “edge where the budget and ideas ran dry”. 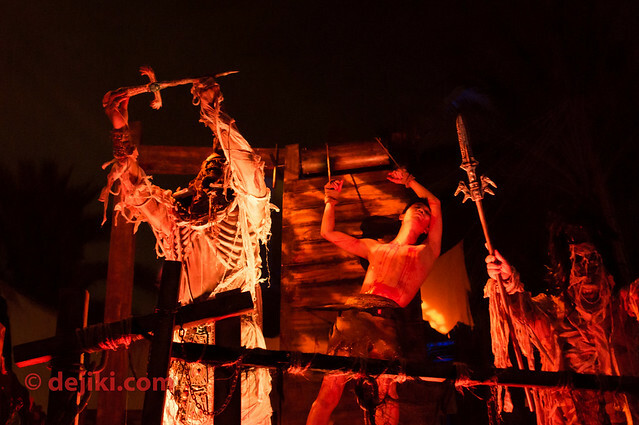 In 2012, the park made Ancient Egypt into a TRUE scare zone. There’s all sorts of weird things happening, a cart full of body parts (not even bodies!) and bizarre objects and even more eccentric characters. There is a snake woman, an anthropomorphic seer and some peddlers selling… well, stranger things. It almost feels like an Ancient Egypt adapted last year’s Carn-Evil, and it was well executed. However, this zone is extremely cramped (and rather small and short) so it is difficult to really see what’s going on. Better hit this area early or save it for last. 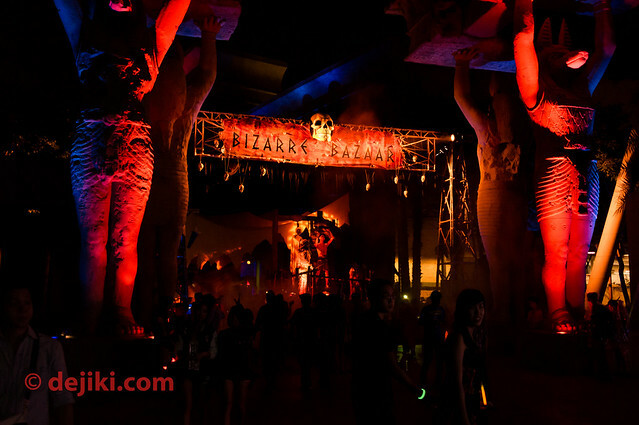 Click here for more photos and a walkthrough video of Bizarre Bazaar. Similar to last year, the haunted houses are located at Stage 28 (behind New York) and New York Lagoon Path + Water Street (New York). This year, a new house was built at the Waterworld queue. The experience of Dungeon of Damnation begins from a cave (as seen in Before Dark 3). Guests climb out of the “cave” right into the drawbridge leading into the Dungeon. There, they meet the Undertaker, who directs them through two paths. He doesn’t really do anything except to welcome guests (in the most discreet way) into his Dungeon. Both of them lead to the same corridor of skeletons. This Haunted House has a lot of graphic imagery. Well, it is meant to depict a realm of death. There is a corridor of filled with skeletons on its walls, and another with a lot of disembodied, talking heads. There are some interesting and very scary rooms here, including one filled with rotating spike pillars, floors strewn with “maggots” and big rotating grinder (be aware of the wheel’s spokes that may separate a group). Be prepared for numerous tight passageways filled with dangling heads and body parts. My favourite part is a “jump and glide” scare actor. There’s also a room where the walls will give you a surprise. I’ll leave you to find out what and where these are, but let me just say this: You should always be careful, and look in all directions before walking around in the Dungeon of Damnation. Death Alley takes place in New York’s harbour pathway, leading towards Water Street. This is a short but intense experience. The layout is very cramped (even in the day) and there is an abundance of scare actors ready to attack. 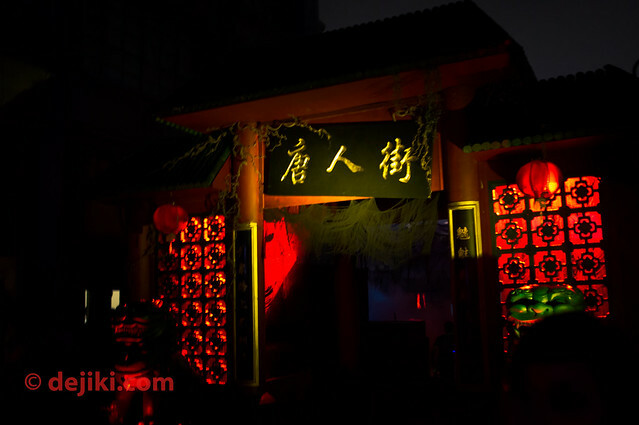 The haunted house experience starts from a street food bazaar, filled with twisted hawkers, eventually leading into Water Street. 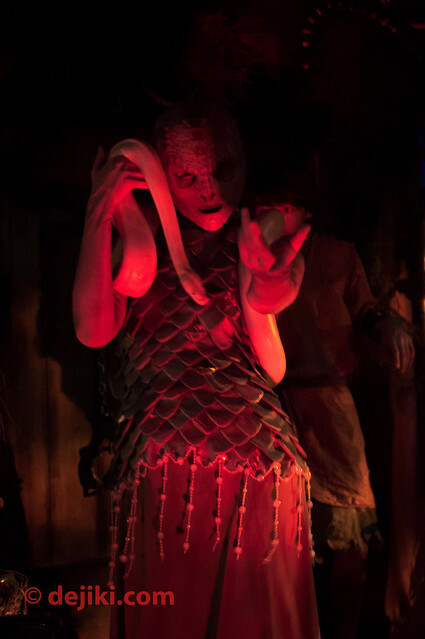 There, the morbid “Pleasure Inn” welcomes its latest victims… to be enchanted by its grotesque courtesans. To add on to the atmosphere, a very foreboding and slow remix of “Waiting for your Return” (等著你回來) by Bai Guang (白光) is played at Death Alley and its queue. I would say that this Haunted House was pretty alright, until the “Pleasure Inn” scene, where the amount of scares and props just drops to barely anything. There was too much to see in the first half of this Haunted House. Also, there was a lot of creepy music playing here. Doctor Dementia runs The Insanitarium, a venue for cruel therapies and gruesome experiments. The experience starts off with the prison portion, with some encounters with the “criminally insane” inmates. Some scenes include a morgue, electric chair chamber, a video surveillance room, Doctor Dementia’s room (which is very cramped! ), a disorienting padded cell and a few rooms with haunted tables. As this is pseudo-hospital/prison (or an asylum trying to be a hospital), be ready for graphic imagery of gore, cuts on skin and well, random parts of bodies scattered around. There is A MAJOR water effect in one of the rooms here, be prepared for a SPLASH! I felt that this Haunted House was really long. There were countless rooms and it never seemed like it was going to end. Definitely an abundance of scare actors here, and they attack from all directions. My favourite room in this haunted house is actually the final room, with (I think 5) locked doors, each with an exit sign above it. Suddenly, all the lights start to flicker… as if taunting victims that there is no escape. Also, it might interest you that souvenir photographs can be bought at the exit of this haunted house. There is a hidden camera in one of the rooms in the Insanitarium, but there really isn’t a point to find and “get ready” for it. Feel free to share your experiences and how you felt about Halloween Horror Nights 2 in the comments section. If you have any questions about the scare zones, haunted houses or event, post a comment! 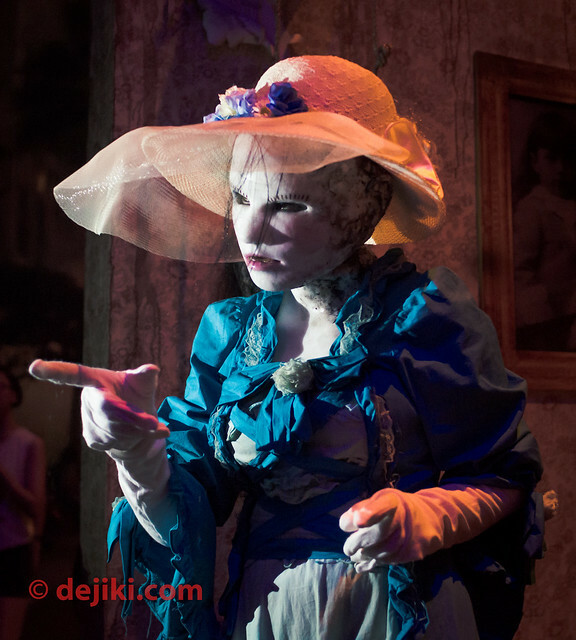 More features and photos can be found on dejiki.com as part of our extensive coverage on Halloween Horror Nights 2. 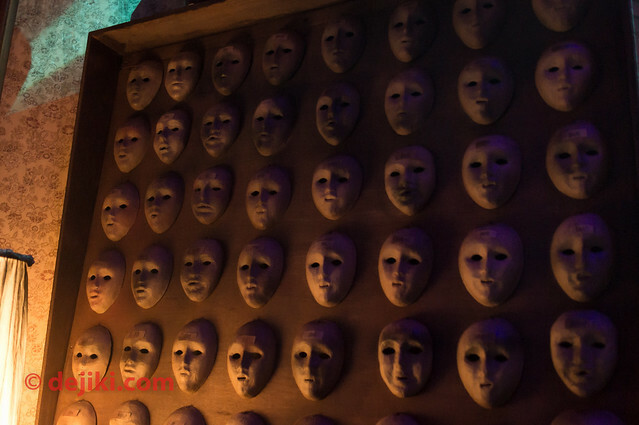 Domains of Fear features photos and videos of mayhem captured during Halloween Horror Nights 2. 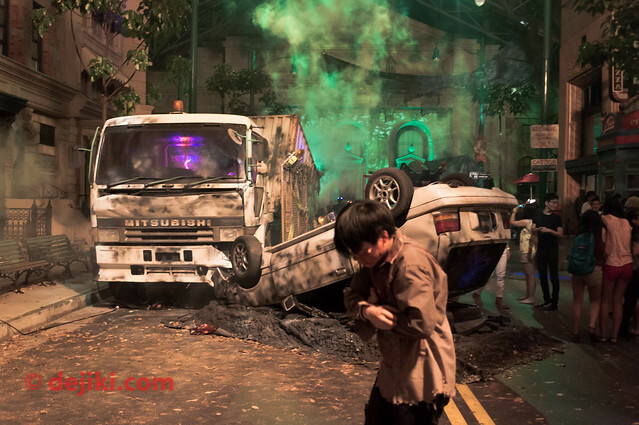 See how Universal Studios Singapore gradually transforms into five scare zones and three haunted houses. This mini-series showcases photos of the park in the day, before terror strikes! If you feel that you’re up for Halloween Horror Nights 2, more information about the event, including event hours, attractions and ticketing, can be found here. Details on other attractions in Singapore can also be found in the same entry. Hey dejiki! I’m planning to go tonight, what route/plan would you suggest I take in order to go on all the houses and ‘big’ rides with the least wait? Thanks! 1. Be at the park gates very early, like 7:00pm and start to wait at the entrance. Once the gates open, quickly form up lines to the ticket gantries and get into the park as soon as possible. 2. Skip all the scare zones and photo-taking first. Go to Dungeon of Damnation first, followed by Death Alley and the Insanitarium. – You should be able to at least clear one of the Haunted Houses before 8:30pm. If the wait time exceeds 70 minutes, you might want to skip the Haunted Houses until 11:30pm. 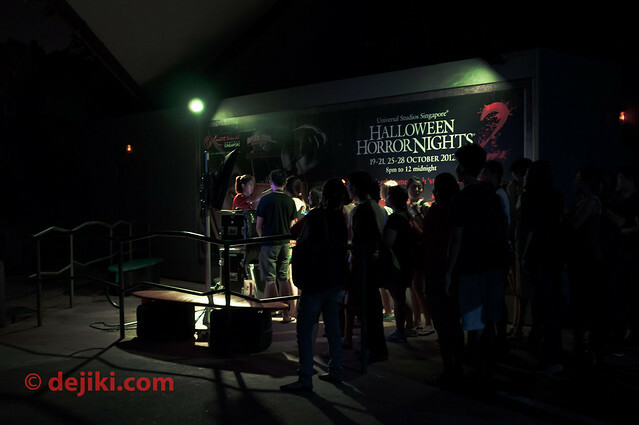 – From 11:50pm onwards, the wait times for Haunted Houses should be less than 10-30 minutes. NOTE:This really depends. The wait time for Death Alley was 100 minutes at 11:55PM during the second night. 3. After you’re done with the three Haunted Houses, head to the rides. Battlestar Galactica and Transformers: The Ride will have the longest wait time. I would actually suggest skipping the rides to experience the Haunted Houses and Scare zones, which are not available in the day. 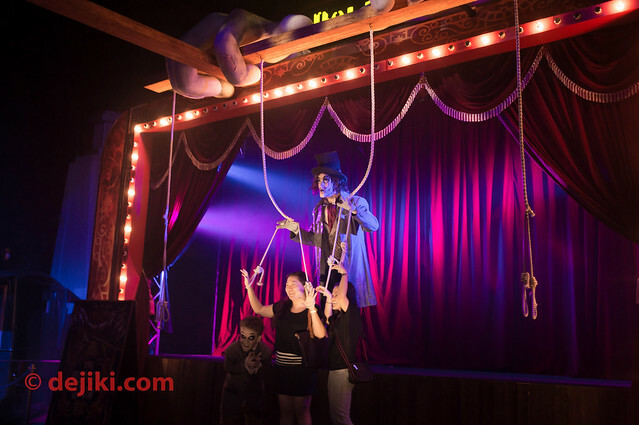 The HHN2 RIP tour is ideal if you prefer to have a guided tour around the scare zones, and access the haunted houses and park attractions with hardly any waiting time. 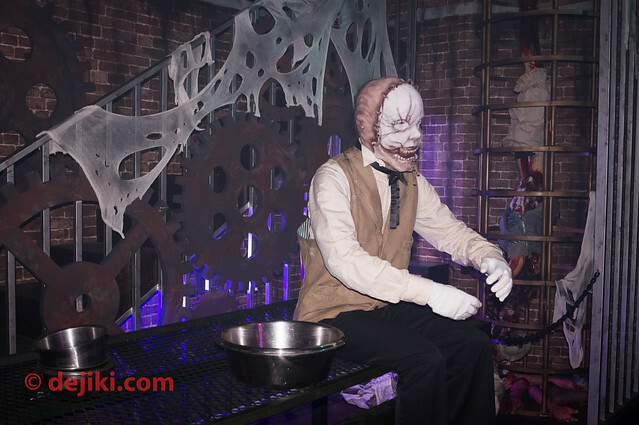 You will be able to visit all three haunted houses and most of the park’s major attractions within 2.5~3 hours. The RIP tour guide will also provide backstory for each scare zone and haunted house to add onto the experience of Halloween Horror Nights. RIP is the best option if you have the cash. It’s definitely worth all your money, because it guarentees you can visit all the halloween attractions at least once, even twice if time permits. You even get priority in photo taking with the characters, which can take a long time. On the side, you also can rest in the VIP lounge, sip TWG tea, and get ready for the long night, before the event, instead of joining the mad crowd in front of the entrance (no joke). You can also get 10 FnB voucher to grab supper before heading home, and 10% off mechandise if you are interested. 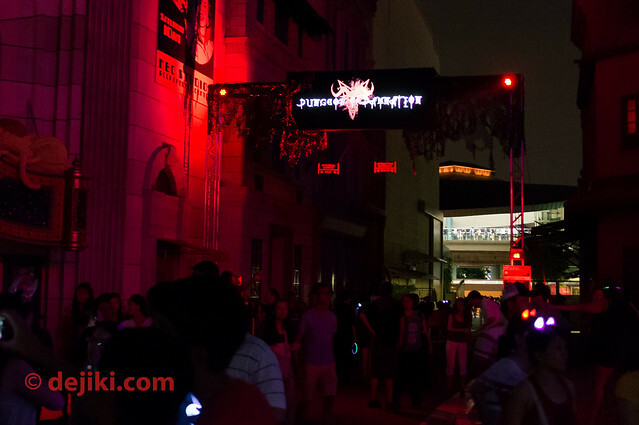 Thank you for your detailed write up on your adventure for Halloween Horror Nights 2. I am now slightly more prepared and have a slight clue on what is expecting. I will be going along with 2 other friends tonight and I am still very much afraid. Would you recommend the same route to take as Nigel if I wish to level up my scare intensity slower? As you said that you are still afraid, perhaps heading to the Haunted Houses first might not be the best idea. However, I believe that once you walked through one of them (and screamed your heart out), you will feel a lot more comfortable and start to enjoy the experience. If you wish to gradually level up the intensity of scares, instead of going directly to The Insanitarium via Madagascar and Far Far Away after walking out of “House of Dolls”, walk towards New York. 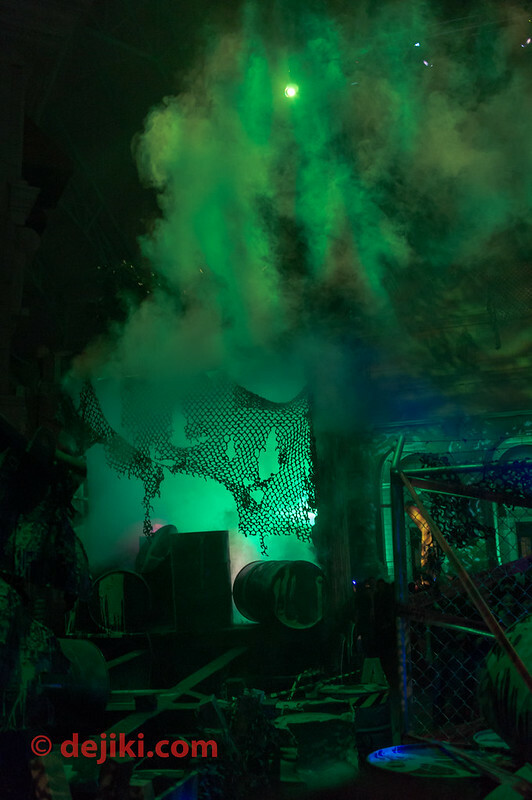 Have a stroll through the “Total Lockdown” and “Bizarre Bazaar” scare zones, so that you can get used to the dim environment, props and scare actors. When you are in the Haunted House, hold hands (or lock your arms) with your other two friends. Walk slowly, explore each room and keep an eye out for scare actors coming out from their hiding spots. I wouldn’t advice looking at the floor or keeping your eyes closed – you’ll miss the incredible amount of detail in the Haunted House’s rooms! It’s best to dress for comfort – it’s an outdoor event. Wear comfortable flat shoes as the floor may be uneven and/or wet! You’ve done a great review of the show! Very detailed and informative but did not ruin expenctant guests’ experiences. 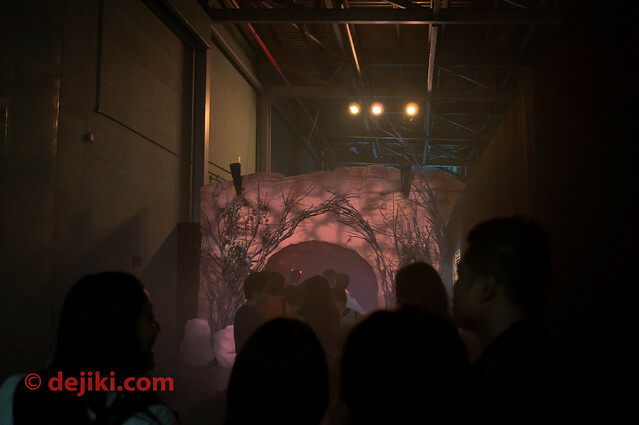 Was at the event tonight (20/10) and the Dungeon of Damnation was totally inspired, seriously I would say maybe the scariest maze of all my HHN’s since 2003… Loved Insanitarium too and Death Alley, but Dungeon was just great, even with loads of people going through, It had us running… And the use of powerful intermittent strobes in Insanitarium, people just didn’t know which way to turn. So many disturbing scares and truly original too. Great, great night, I was very impressed. Joe from Australia. Great to hear from you, Joe! Did you get an Express pass? How long did you wait for the Haunted Houses and attractions? Yes definitely Express Pass, coming all this way, wasn’t going to leave that to chance! Queue length and time factors are probably the only thing that people complain about…! Hi. May i ask whether are photos allowed to be taken inside the haunted houses? Photography and video recording is not allowed in the haunted houses. You can take photos at the three scare zones, so be sure to capture as many photos as you can! So would i be able to bring in my camera but won’t take any pictures or they dun even let us bring a camera inside? Yes, you would be able to bring your camera into the Haunted Houses. As long as you don’t switch it on and start taking photos or record a video, it will be fine. I’m more or less pleased. I do not feel the scares was enough though. For me it was rather boring, but that might be because I’m rather used to it. During “Death Alley” I were fortunate enough to be behind some girls who seemed to be screaming of pretty much everything. It almost became comical. The queues 21/10 seemed to be around 30-45 minutes for all haunted houses. I didn’t see it go up towards 100 minutes. I did, on the other hand, see it being 65+ minutes for the transformers ride. One room that completely took me by surprise was the “spiral” bridge room at the end of Dungeon of Damnation. I’m not quite sure whether it was me or the bridge moving. This comes even from someone who’ve been on offshore supply ships with 25-30m high waves. I really liked that part, but they could’ve added more to it. For me it was a 3.5/5 night in total. I do feel that I need to travel to Universal Studios Singapore once more during daytime to experience the other rides though, but I’m not quite sure whether I can afford to dish out another SGD 68. We’ll see I suppose. Glad to hear that the crowd conditions were better on the 21/10. There were definitely a lot less people at the park compared to the first two nights. How did you feel about the padded cell in the Insanitarium (with strobe effects) and the final exit room? The bridge in the spinning room in Dungeon of Damnation does not move at all, but if one is were to stare at the spinning portion, they will feel disoriented. I’ve been to these types of rooms before and some people do feel like they are going to fall over. Great to hear that you had fun! So which Haunted House do you like best? Heading there Friday night… very excited! We also (specially…!!) arranged to have dinner in KT’s Grill during the park conversion to skip the queues at the turnstiles and I’m going to direct the group to go to the Dungeons first so that we’re the only ones in there (well, we’re a group of 12, so it won’t be SO empty. haha)… thanks for you strategy though – will be very useful to maximize time! Plan to do haunted houses first, then rides then scare zones until the end. Might even do 2 rounds of haunted houses if we have the time and if we don’t need to use the express pass the first time around!! Hi Marcus, It’s great to know that you have a plan and intending to take advantage of being patrons at KT’s Grill. With right planning and (some running! ), it’s definitely possible to do two rounds of Haunted Houses even if you don’t have an express pass, but you’ll need to sacrifice the other attractions in the park. If you have the express pass, it’ll be a lot easier to achieve that and you can go for the rides too. Right after Dungeon, go straight to Death Alley (or Insanitarium, but I’d recommend Death Alley since you’re nearby). You should be able to finish all three Haunted Houses by 8:45PM if all goes well, with 4 more hours to spare for a second go, or even more. We all have express passes, so going to make total use of them. Am going straight to Insanitarium right after the Dungeon cos hopefully that one will be empty at that point (with people still coming in and being “stuck” at the Doll area). Also very keen to do the Lost World Ride and Battlestar at night, so those will have to go somewhere in between. As you can tell, I’m quite excited… haha. It’s good to be excited – I’m sure the Haunted Houses will definitely be memorable. For my first walkthrough in all the Haunted Houses, I was always the first person to step anywhere (extra thrill factor for me) and I made sure to leave a big gap between me and the next group in front of me. That gave the scare actors ample time to “prepare”.. haha. will definitely come back to discuss!! will also remember your tip on the space between groups for a “reset”! And loving the pictures, may i just ask what camera did you use? Hey Dejiki! Love your post on HHN 2! I had a lovely time with my cousins! And also loving the pictures, may i just ask what camera and equiment you used for taking the pictures while you were there? Thank you! Keep on posting! Hi! Great post there 😀 Looking forward to my trip here this coming Saturday 🙂 One of my main concerns, however, is the weather. Will the park close early if it rains? In case of rain, the event will still continue. You may want to refer to the “What if it rains during HHN2?” section above. Do bring umbrellas just in case! Poncho are available at the park at $3 each. Hi, for those who are interested or keen in going tonight, 25th. I have a pair of tickets for sale at only $90, I couldn’t make it so my loss is your gain. you may contact me at 98800666. thanks! sorry to hijack your thread. What is the minimum age requirement to go in the park? And are we allowed to wear costumes? There is no minimum age requirement, but I would suggest that children below age of 13 to be accompanied with an adult. Costumes and masks are NOT ALLOWED at Halloween Horror Nights. Hey guys, any idea if the main door tickets and priority passes will sell out? i only plan to purchase them at around 5pm. I highly don’t recommend buying at 5pm on the same night you’re visiting. Try to buy in advance. Tickets for today and Saturday are already sold out. Express passes may still be available until 10-11pm during the event. They may get sold out earlier if the park is too crowded though.